A Jaipur two day itinerary will be useful for travellers visiting the pink city for the first time. It will help them explore more places in a limited time. On a two-day trip to Jaipur, you must explore the city’s cultural and architectural splendours. Although you can’t see it all, an ideal Jaipur two day Itinerary must include a visit to some of the pink city’s most astonishingly well-crafted palaces, magnificent forts and temples. Jaipur has been named after its founder Maharaja Jai Singh II. He was a great warrior and astronomer. The city exemplifies his genius. Although Jaipur city has a traditional layout, it is quite modern. It has an identity of its own which has been built by the merger of knowledge, science and art. This wonderful amalgamation of various aesthetic values is the reason why Jaipur has been unanimously chosen as one of the most beautiful cities of the world. The royal city is not only extraordinarily beautiful but also a symbol of the vibrant Indian culture. The most striking feature of the city is the pink wash applied to a majority of the buildings, giving Jaipur its universal title, the “Pink City”. In my current travel blog, I will share with you my Jaipur two-day itinerary. This will act as a Jaipur travel guide and help you utilise your two days in the city in an optimal way. Planning a short trip will be easy with a Jaipur two day Itinerary. The itinerary will ensure that you don’t waste any time on deciding where to head next. This itinerary is based on my experience of visiting Jaipur. I have visited Jaipur on multiple occasions ranging from a few hours to a few days. Start your day by paying a visit to the City Palace in the centre of the City. Explore the places in the complex and visit the nearby attractions like Jantar Mantar and Hawa Mahal. 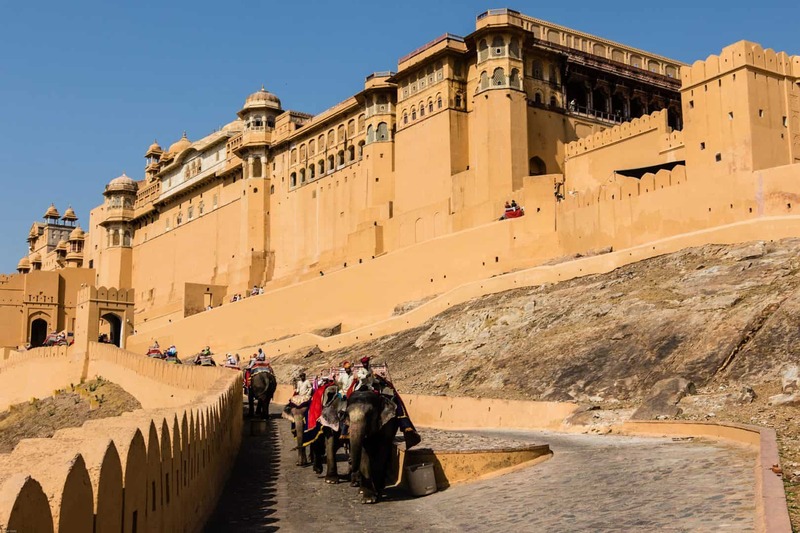 Start early and head to Amber Fort. 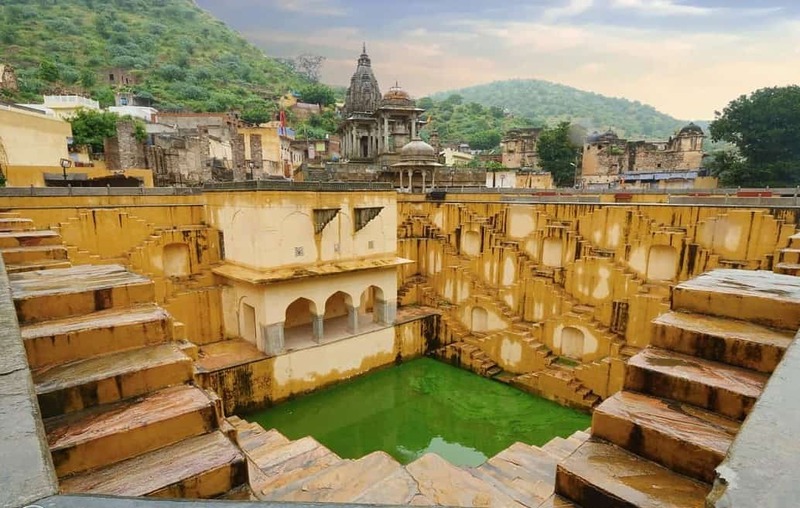 Visit the Panna Meena ka Kund and Jaigarh Fort nearby. After this, visit the Jal Mahal on your way back. Have Lunch in the main city and move towards the Galtaji Temple. As the evening sets in, visit Choki Dhani. After spending a few hours and having a great Rajasthani meal, head back to your stay/ next destination. Jaipur is a very travel-friendly destination. It is easily accessible from different parts of the country through flights, railways and roads. 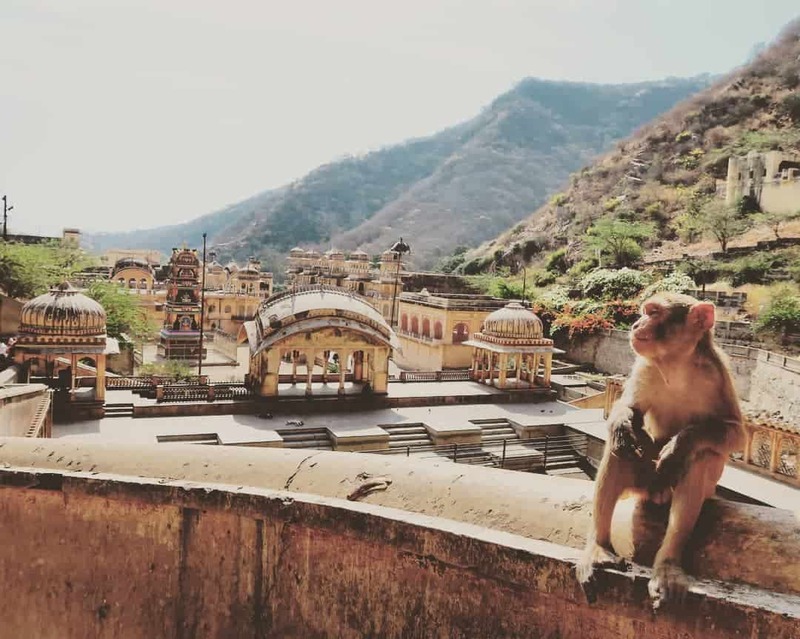 Before I go into the details of how to plan 2 days in Jaipur, here are the options that you have to reach Jaipur. There are regular flights connecting Jaipur with other major cities of India. A few Asian cities like Sharjah, Dubai, Kuala Lampur and Bangkok also run direct flights to Jaipur. This is the most budget-friendly option for travelling to Jaipur. The Jaipur railway station is centrally located, so you don’t have to spend extra to reach your hotel or the city’s major attractions. Jaipur is fairly close to many Indian cities like Delhi, Agra, Ajmer etc. Therefore, you can travel by bus or by your own private vehicle. The condition of roads is decent and a road trip is a lot of fun. No matter what option you choose, you will not have any problem in finding a suitable conveyance. The first thing that comes to mind when choosing accommodation while travelling is – where should I stay and what kind of accommodation should I look for. Below are my suggestions regarding these concerns. Which is the best place (area) to stay in Jaipur? Jaipur is a big city and it can get confusing to choose an area to stay for first-time travellers. I always put a lot of thought when choosing an area to stay in a new city. I consider three things- location, access and safety. The location should be central to most of the city attractions, it should be easily accessible and last but not least, it should be a safe area. These considerations become more important if you are travelling alone. This area is the best if you want to stay close to the old Jaipur sights. There are many budget hotels and restaurants in this area. The area is also safe and easily accessible. The Mirza Ismail Road is the main road that runs from Sanganeri Gate to Government Hostel. It is very well connected to the rest of the city. There are plenty of budget hotels in the area and many eateries in the neighbourhood. If you don’t find a place in these areas, you can also look into Hathroi Fort Area, Jal Mahal road and C Scheme. If you wish to be close to the airport, Tonk road area is a good option. What are the budget stay options in Jaipur? There are many hostels, guesthouses and budget hotels in Jaipur. I would suggest you book early, especially during the peak tourist season. Always read the user reviews on the website and on google before booking. Some of the hotels don’t welcome unmarried couples. Therefore, make sure you check that once. 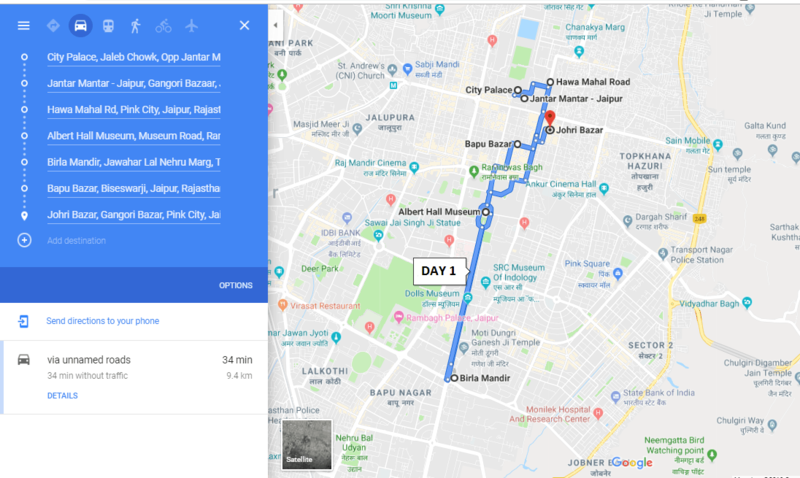 If you are planning a trip to the pink for the first time, this Jaipur two-day itinerary will help you cover most of the attractions in the city more efficiently. On Day 1 of your Jaipur two-day trip, you can visit the old city. Most attractions here are located within walking distance to each other. Therefore, you won’t have to travel much. You can cover the places I have mentioned below and in this very order. This is the most efficient way of travelling in the city. It will help minimize the time spent travelling and will give you more time at each attraction. Relive history with the collection of ancient artefacts. These might look like too many places, but trust me, you can cover these in a day. This Jaipur two day itinerary is based on my personal experience. You can skip a few locations based on your taste and comfort level. Start your Jaipur visit with the magnificent City Palace. Have an early breakfast and reach the Palace by 9.30 am. City Palace is located in the centre of the pink city and is as old as the city itself. 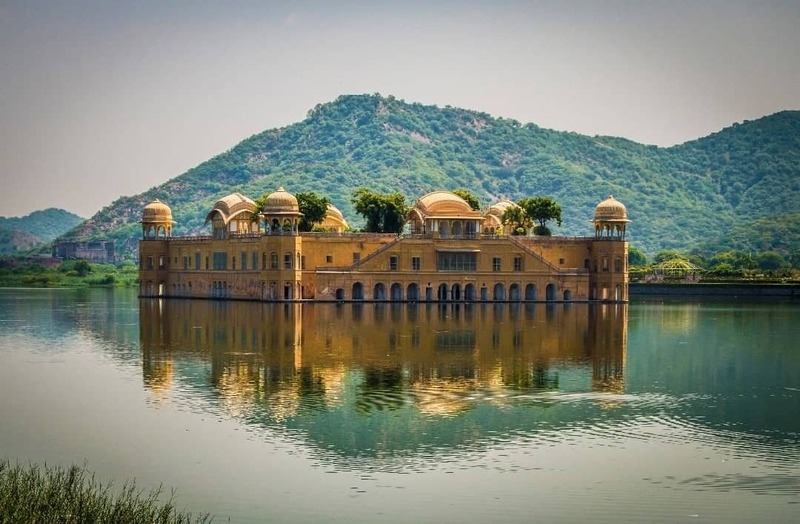 The splendid architectural blend of the Rajasthani and Mughal styles this is the first place you should include in your Jaipur two day itinerary. The palace was originally built by Maharaja Sawai Jai Singh between 1729 and 1732 but many features were added to the monument by the subsequent kings. The City Palace Complex is huge and you require different tickets to see different parts. With the basic ticket, you can only see a few galleries and the palace from outside. The palace has a museum open to visitors. During the summer vacations, students and the general public can enrol themselves in various courses such as music, dance, and art offered by volunteers. There is a market within the palace where one can find the most beautiful bed sheets, quilts, kurtis and souvenirs. You can check them out if you like. Although I did find it to be a little expensive. 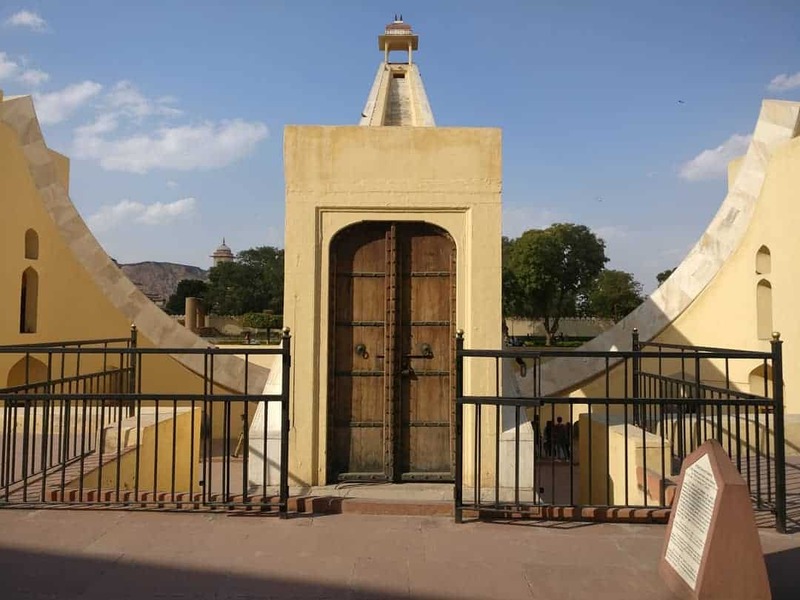 Located just next to the City Palace is Jantar Mantar Observatory. Jantar Mantar is a must visit if you are interested in astronomy and science. 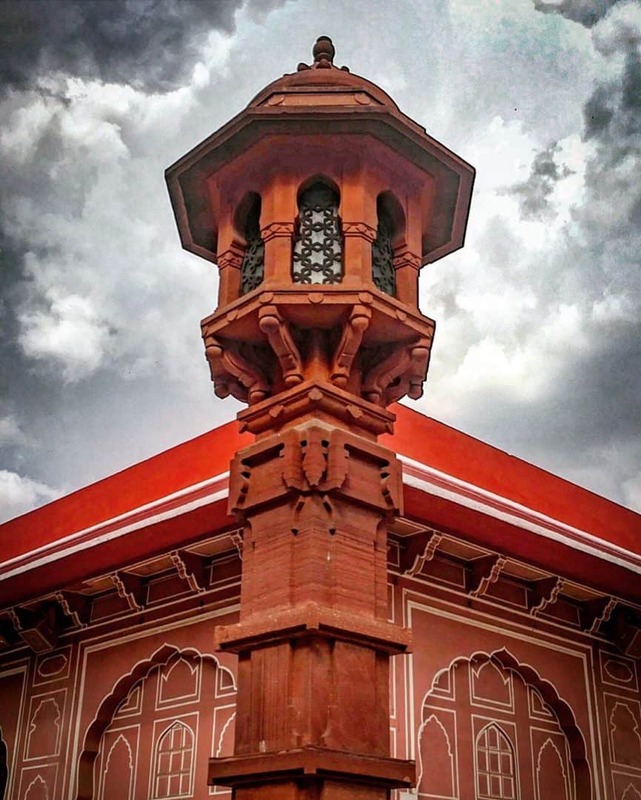 Built by Sawai Jai Singh II, the observatory has a collection of nineteen architectural astronomical instruments. This is one place where I would insist you hire a guide. It was astonishing to see the huge instruments worked perfectly even today. Since the observatory is an open space, make sure you carry hats or scarves to protect yourself from the sun. Hawa Mahal or the palace of winds was constructed in 1799 under the leadership of Maharaja Sawai Pratap Singh. It is one of the most prominent landmarks of the Rajput dynasty in the Pink city. The five-storied palace is shaped like a pyramid with arched roofs and a number of small windows and screens. Intricate carving and detailing are visible in the front portion of the palace and much attention has been paid to the minutest facts. The prime intention of building this magnificent palace in the pink city was to allow women of the royal household a view of the ceremonial processions going on around the city while they sat behind the small windows. The Hawa Mahal looks and clicks the best from the road. So, if you are only interested in the pictures, skip buying the ticket. After having covered these three important moments, you can proceed for lunch. There are a number of restaurants and eateries near the Hawa Mahal area. Post lunch head to the Albert Hall Museum. Built in the Indo-Saracenic architecture, this museum is the oldest in the state of Rajasthan. It also happens to be the State Museum of Rajasthan. You can click pictures with your phone but can’t use your camera. As soon as you see the museum the royal architecture strikes you. The museum houses some very beautiful pottery, textiles, paintings and artefacts. Take an audio tour, to help understand the collection al little better. The museum looks amazing at night when it is all lit up. You can see it while crossing the area at night. At a walkable distance from the museum is a beautiful garden Ramniwas Bagh. You can take a stroll here if you like. If you already feel tired you can skip the next destination and head straight for some shopping. The temple is dedicated to the Hindu god and goddess of wealth Laxmi Narayan. The temple is built in white marble. The inner and outer walls are adorned with carvings and teachings from Hinduism, religious thinkers and philosophers. The temple looks stunning at sunset. If you still have some time and strength left in you, you can explore some local markets. If not, head back to your hotel. A haven for shoppers, Bapu Bazar is located nearby the Johari or Johri Bazar. This market is a one-stop destination for all your needs. You can buy all the authentic Jaipuri items at a reasonable price in this market. If you have to buy souvenirs, this is the place. The street food here is amazing. Try the Kulfi Falooda here, you will love it. Johri or Johari Bazar is one of the best places to shop in Jaipur. Although most famous for jewellery, you can find a number of other things here. These include leather goods, bedsheets, clothes, etc. Make sure you compare the prices and check the quality before buying. Don’t be shy about haggling It’s a skill best used in places like these. If the shopping gets exhausting, there are many eateries around the place. You can grab a quick snack if you like. On day 2 of your two day trip to Jaipur, you should be visiting the slightly far off places. 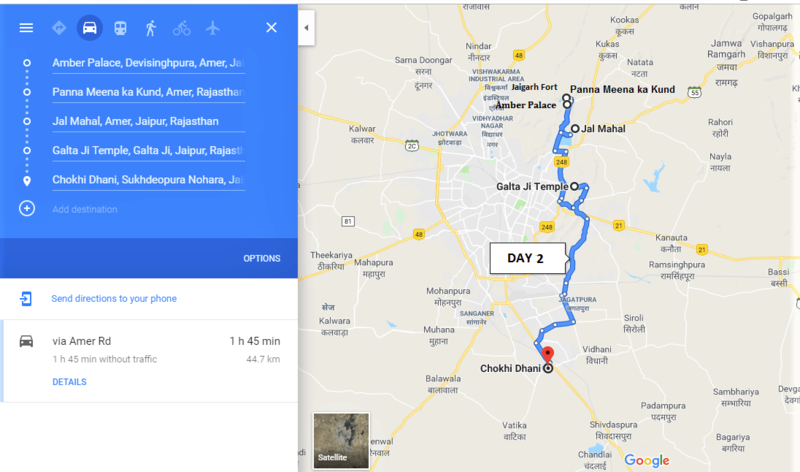 Here are the places I would recommend you to include in the second day of your Jaipur two day itinerary. 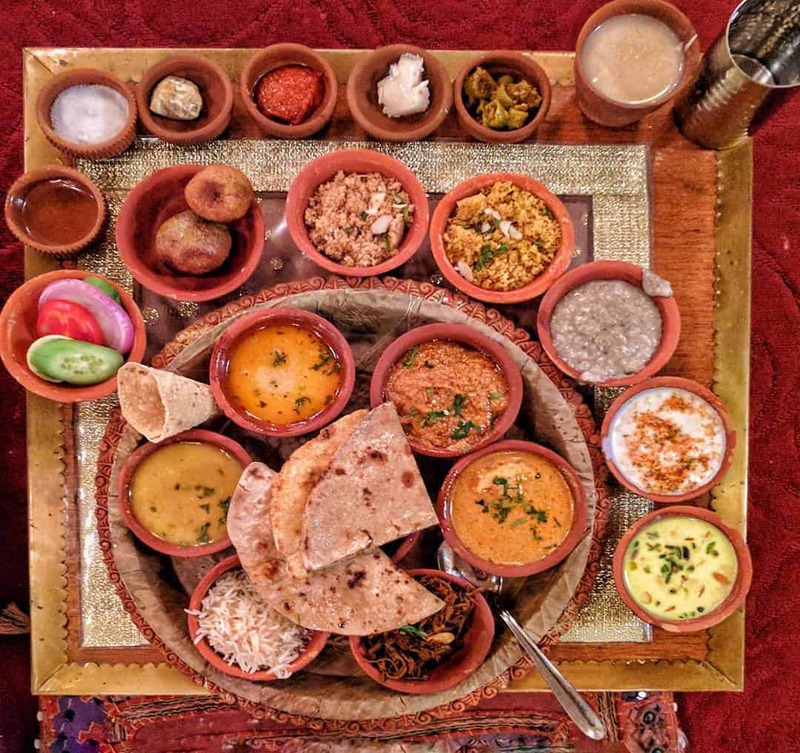 Experience Rajasthani culture & food in one place. Start your second day with a trip to one of the most important palaces in Jaipur. Built in red stone and white stone and located on a naturally formed ridge (Cheel ka Teela), the Amer Fort stands tall in Pink City Jaipur. Amer or Amber Fort is an architectural marvel and is a blend of both Rajput and Mughal style of ornamentation. 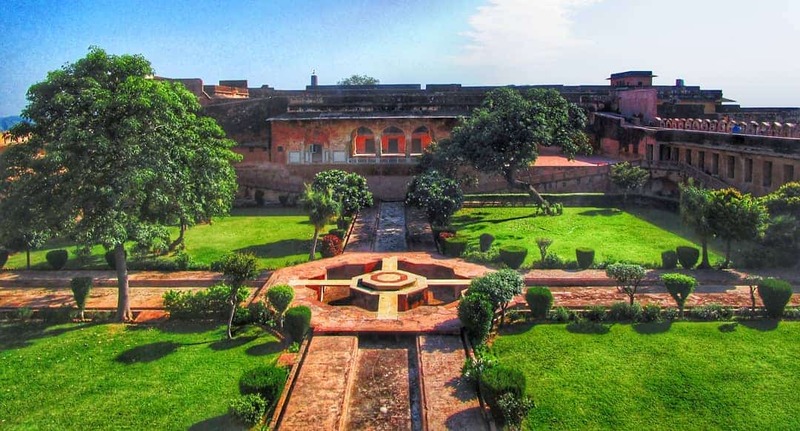 The fort was built by Raja Man Singh I who happened to be one of the Navratnas of Emperor Akbar. There is a small lake (Maota lake) on the front side of Amer Fort that adds to its beauty. It also soothes the eye amidst the dry weather of Pink City. 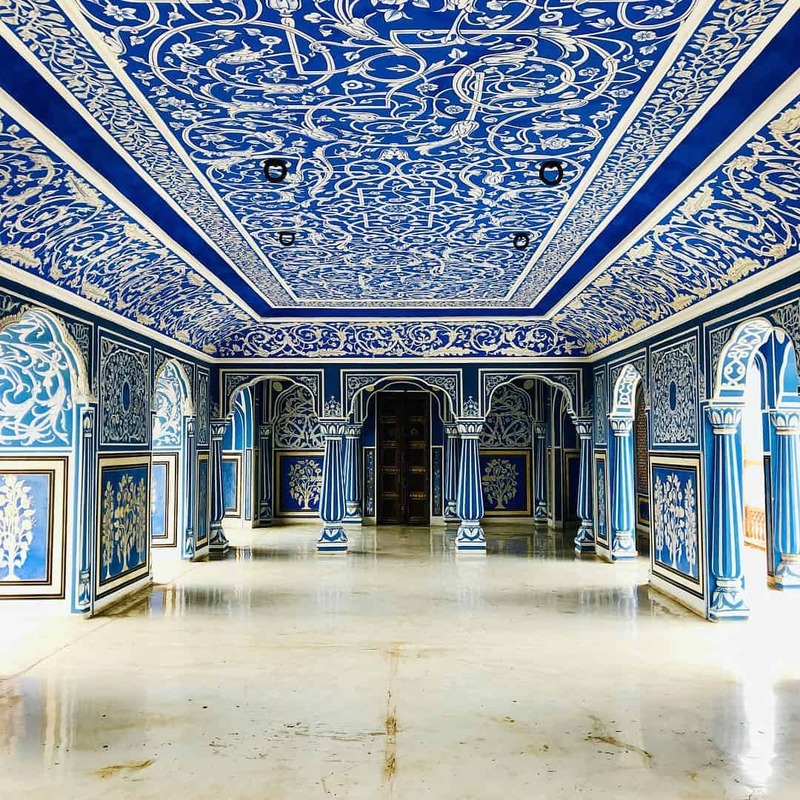 Sheesh Mahal is the most beautiful aspect of the Fort. The mirror work will leave you awestruck. The fort can be explored fully and one can even hire a guide to unravel the place well. Audio Guides are also available, although they are not very good. I request you to refrain from taking an elephant ride up till the fort. There have been serious concerns over the treatment of these animals. You can either walk up (about 15 mins) to the fort or get into one of the jeeps or cars that are easily available near the base of the fort. Amer and the Jaigarh Fort are located nearby and considered as one unified structure. Both these palaces are connected through a tunnel. You can easily walk up to the Jaigarh fort from Amer Fort. It took us about half an hour to reach Jaigarh fort from Amer Fort. Jaigarh Fort was used as an important military establishment and was built to protect Amer Fort. It acted as a cannon foundry during the time of Mughal emperor Shah Jahan. Another interesting feature our guide told us was about the water harvesting system. The palace has an elaborate system for monsoon water collection, filtration and utilization. The fort provides a splendid view of the entire Jaipur City along with Amer Fort. Not many people visit this place, therefore, you have ample space and time to click some pictures. This is a beautiful historic stepwell & rainwater catchment near the Amber Fort. The stairways are beautiful and are aa perfect spot for some amazing pictures. You can spend up to half an hour here. For a change, there is no entry fee here! The place needs to be maintained properly. I guess that is the downside of free entry. On the way back from Amer Fort, stop at Jal Mahal. Although this place is best visited in the evenings, afternoons are not bad either. Jal Mahal, the water palace, was also constructed by Maharaja Sawai Pratap Singh. It is situated in the heart of the Man Sagar Lake in the Pink City. The purpose of building this beautiful palace was solely recreational. Later on, during the 18th century, Maharaja Jai Singh II got the palace and the lake refurbished. Though the palace is now deserted, it is practically well preserved. The first four floors of the monument are under water. Visitors can see only the top floor that remains outside. The palace looks particularly mesmerizing during the monsoons when the red sandstone work appears clean and sparkling new. Visitors are not allowed to enter the Palace and you have to enjoy the view from the promenade. You can enjoy the cool breeze and click pictures in front of the palace. Professional photographers are also available nearby who will click your pictures and provide you with hard copies before you leave the place. After spending some time near the lake, go for lunch. The next stop is the Galtaji Temple or the Monkey Temple. The Galtaji Temple is an ancient temple complex consisting of a series of temples. The main feature of the temple is its natural springs. The spring water flows into the temple from the hilltop. There are 7 different kunds (water tanks) where the pilgrims take a bath. You will find people around the temple selling nuts and bananas for the monkeys. I suggest that you refrain from this if you are scared of monkeys. I was happy I was not carrying any food because I saw them charge at the visitors for food. Take a direct cab/ Auto Rickshaw/ own vehicle up to the temple. (This was the option we took, we were in no mood of walking). This route will take you through the Rani bagh. The second way to hike up to the temple from the city side. Although there is no entry fee for the temple, you may be asked to pay a donation of 50 INR for the temple. Also, if you are carrying a camera, you are expected to pay 100 INR. The last stop on your Jaipur two day itinerary should be Chokhi Dhani. Chokhi Dhani is a Rajasthani themed luxury heritage resort. It is located on the outskirts of Jaipur and is a perfect place to spend a few hours. If you find yourself in Jaipur for a few hours in the evening, this is the best place to visit. It covers entertainment, food and shopping, all at one place. While you are here, enjoy the folk dances, singing, camel rides, puppet shows, fortune-tellers, etc. There are shopping arcades, huts and shacks and small exhibitions all over the place. It will take you some time to see them all. You also get to see a glimpse of different state cultures like Kerala, Maharashtra, Gujarat, Tamil Nadu, Jammu & Kashmir, etc. To be honest, we had more fun than we had expected. Although when we entered, we thought that it was overpriced, the experience, food and hospitality was totally worth the price. How to travel inside Jaipur? 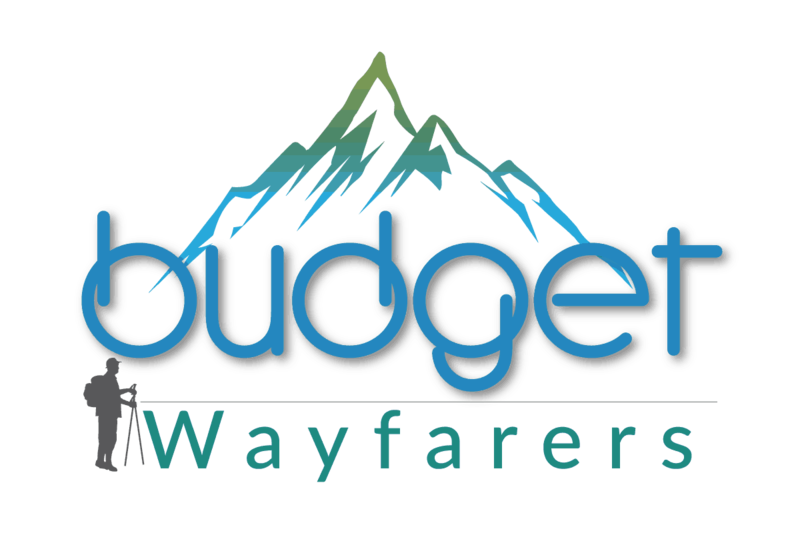 When you are on a budget, you need to take special care of the transportation costs. Below are my suggestions for travelling on a budget inside Jaipur. 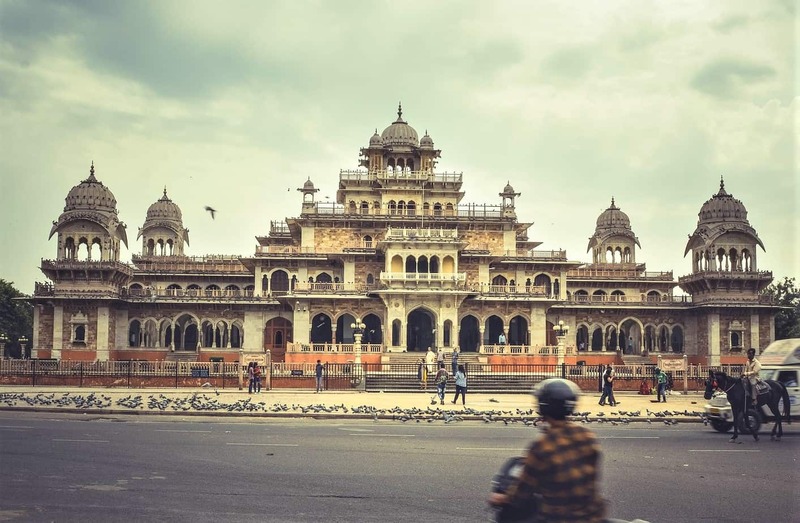 On your first day in Jaipur, you don’t have to travel too much and you can rely on the local auto rickshaws for dropping you from one place to another. For this, the best option is to use the app based taxi services such as Ola or Uber. They are cheaper than the other options. We booked an Ola Cab (an app-based taxi service) in the morning and asked the driver to stay with us for the entire day. If you are a solo traveller and also love to ride, you can also hire a motorcycle for your day 2 in Jaipur. There are various online bike rentals services. What & Where to eat in Jaipur? 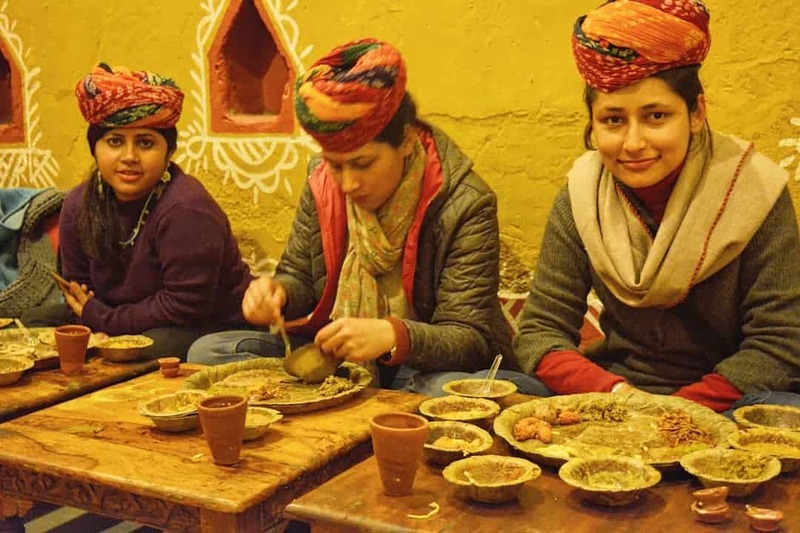 Any trip to Jaipur is incomplete without trying some authentic Rajasthani Food. As a traveller, here are a few things. Laal Maas – A spicy mutton curry. 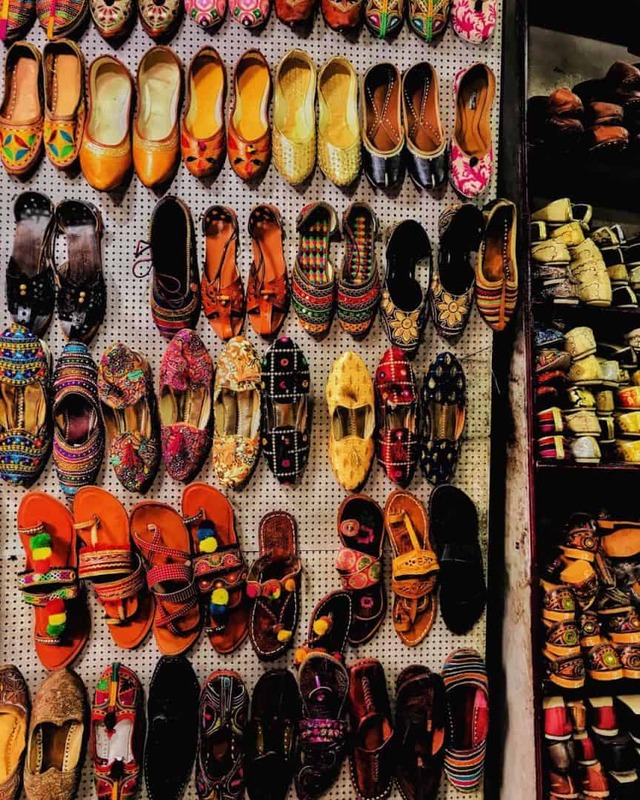 Jaipur is heaven for shopaholics. Jaipur is famous for gemstones, lac products (bangles, decorative pieces, etc), embroidered fabrics, leather goods. One of the best places to shop for jewellery, leather goods, bedsheets, clothes, etc. Buy lac jewellery, a variety of bangles, embroidered textiles here. Take home some of the finest pottery, brass statues and wooden items from this market. Take back some of the most wonderful souvenirs from these markets at rock bottom prices. MAke sure that you really have to use your bargaining skills here. If you plan properly and follow a set itinerary in Jaipur, you can automatically cut down on costs. Composite entry tickets are available only at the premises of Amber Fort, Albert Hall, Hawa Mahal and Jantar Mantar Observatory. If you are a student (Indian or overseas), make sure to carry your student ID card. This will help you claim a discounted entry at many places. Travel in a group. It not only helps you cut down costs on all fronts but is also safer and much more fun. If you want to shop, make sure you visit the traditional bazars or markets of Jaipur like Bapu Bazar. These are much cheaper than shopping in places such as the City Palace or Chokhi Dhani, etc. Instead of going to the fancy restaurants, go to the local eateries. Not only are they cheaper, but they also give you the true Jaipuri experience. Choose a government registered guide. Their services are cheaper. You also need to be careful of the unwanted guides. At some places, a person might start walking with you and start explaining the place. He will later charge you for the same, even if you didn’t ask for a guide. If you don’t want a guide, state that explicitly and tell them that you won’t be paying. Exploring Rajasthan will require some walking around. Wear footwear that is comfortable. The sun can get very harsh during the afternoon. Make sure you carry a hat and scarf to cover yourself. If you are visiting Jaipur during winters, make sure to bring woollen clothes. The mornings and evenings can get very cold in Jaipur during winters. Afternoons can get very hot. Stay hydrated at all times. If you get into a local taxi or auto rickshaw, ensure that the price is pre-agreed or the meter is running. As long as you take care of these things, your Jaipur visit will be delightful and hassle-free. Main Interest: Witnessing the craft of Dyeing and block painting at this small village of Rajasthan. Main Interest: See and shop block painted Sanganeri Prints and handmade paper products in this small town. You can also visit ancient Jain temples nearby. Main Interest: Find out for yourself whether this “one of the most haunted places in Asia,” holds true to its title. 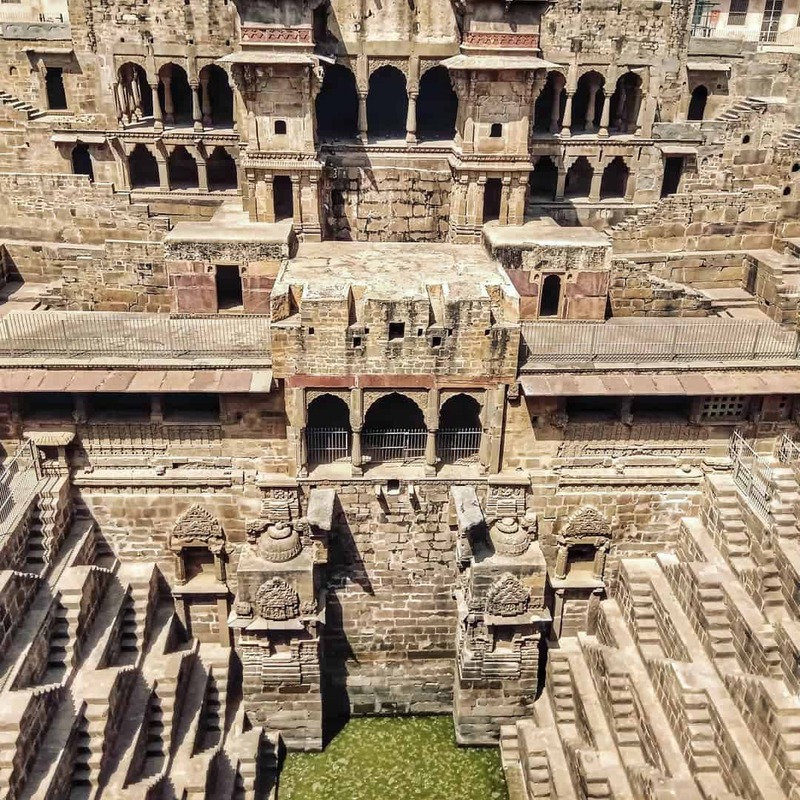 Main Interest: Located in Abhaneri, visit one of the most beautiful Baoris or Stepwells in India. Also, pay a visit to the ancient temple of Harshad Mata. Main Interest: Visit the largest saltwater lake in India. You can also spot flamingos during monsoons. There are a few heritage monuments nearby as well. You can spend a few hours at these locations and head back to Jaipur in the evening. Travellers visiting Jaipur have some common questions. Here I have tried to answer a few of those. What are the places to visit in Jaipur at night? What are the one day picnic spots in Jaipur? Can I rely on the Jaipur metro for local sightseeing? Is one day enough for Jaipur? No, but you can still see a few places. What are the best places to visit in a one-day tour of Jaipur? What are the best places to visit at jaipur in 3 days? Option 1: Visit Gatore ki Chattriyan, Govind Devji Temple and Nahargarh Fort. What are some must-see places in Jaipur? How many days visit is required for Jaipur? Which is better for a historical tour, Jaipur or Udaipur? Which is the best cab service for a one-day tour in Jaipur? What are some travel tips for solo women travellers in Jaipur? 1. Check the property before booking (Traveller Hostels are better). If you find any suspicious activity, leave immediately. 3. Keep your phone charged at all times. 4. Try to tag along with other solo women travellers. 5. Don’t share too many details with strangers. 6. Return back to the hotel/hostel well before night. Although I have tried to cover some most asked questions, in case you have more, drop them in the comment section. I will try to answer them as soon as possible and to the best of my knowledge. If you wish to add something more to it, let me know that as well. Jaipur is one of the most beautiful destinations in India and you must visit it at least once in your lifetime. A trip to Jaipur will surely be something you can cherish for a long time. Divya Sarjolta is an Economics Major and a Gold Medalist. 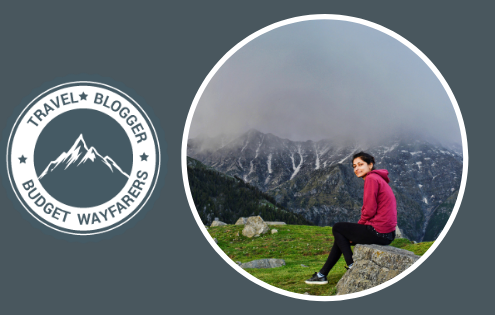 She hails from the beautiful town of Shimla and is a Himachali by birth. She enjoys exploring life to the fullest and has pursued quite a lot of backpacking trips around the country. Two things Divya craves more than anything else is good food and travel. She leads her life on the lines of Oberyn Martell from Game of Thrones, “It is a big and beautiful world. Most of us live and die in the same corner where we were born and never get to see any of it. I don’t want to be most of us.” So, explore while you can! 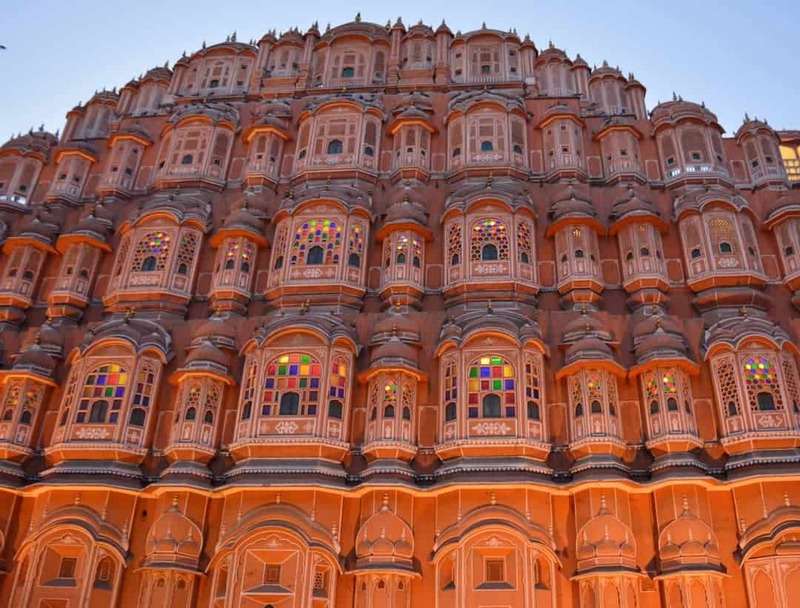 THIS POST ENTITLED, “Jaipur two-day Itinerary: How to Spend 2 days in the Pink City” IS AN EXCLUSIVE PROPERTY OF BUDGET WAYFARERS. ANY INDIVIDUAL OR ASSOCIATION INDULGING IN PLAGIARISM WILL BE DEALT WITH STRICTLY. IF YOU WANT TO USE INFORMATION FROM THE ARTICLE ABOVE, KINDLY QUOTE THE SOURCE.